Whew! 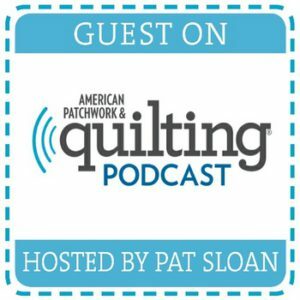 Last week I returned from quilt market 2017 in St. Louis, Missouri. I was working on projects non-stop leading up to it, and then it was of course a whirlwind of a time when I got there. 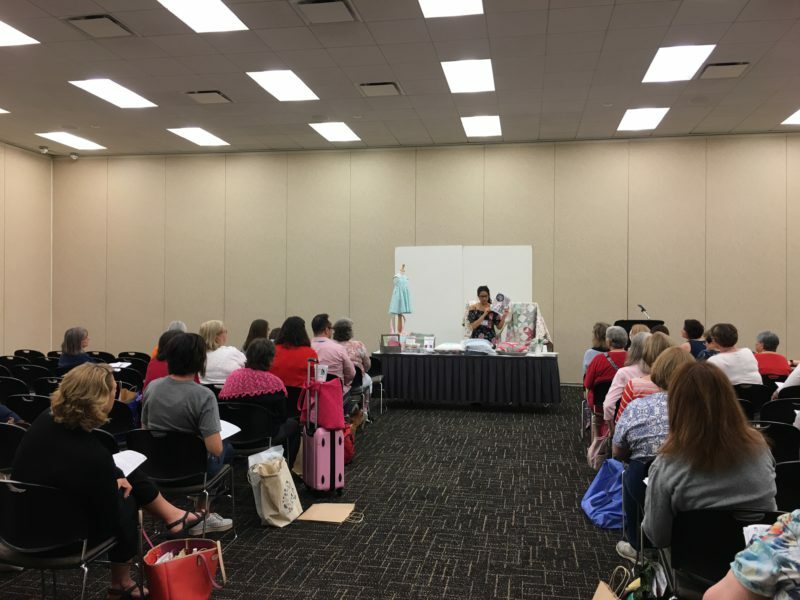 I realized that last Spring I never got a chance to share my quilt market experience, so I made it a point to make this blog post. 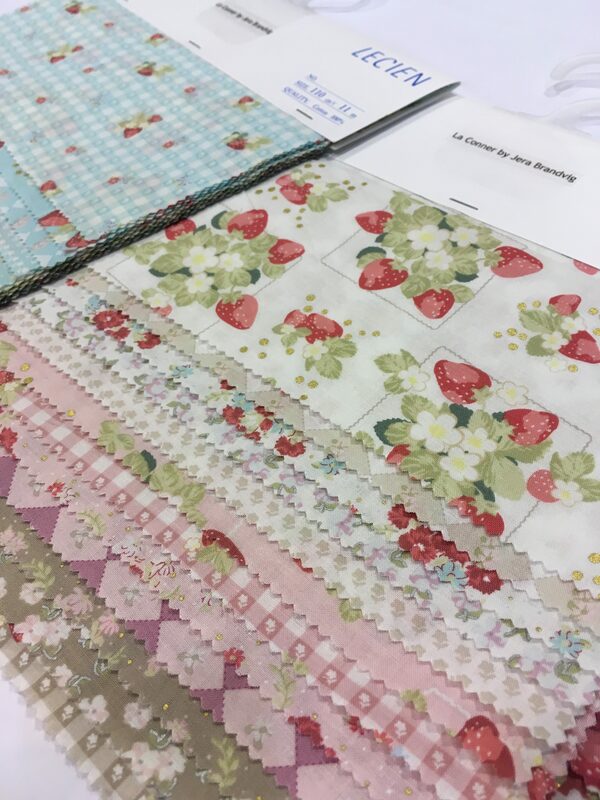 🙂 For those that aren’t sure what quilt market is – it’s basically a big trade show for everything quilt/fabric/sewing related. 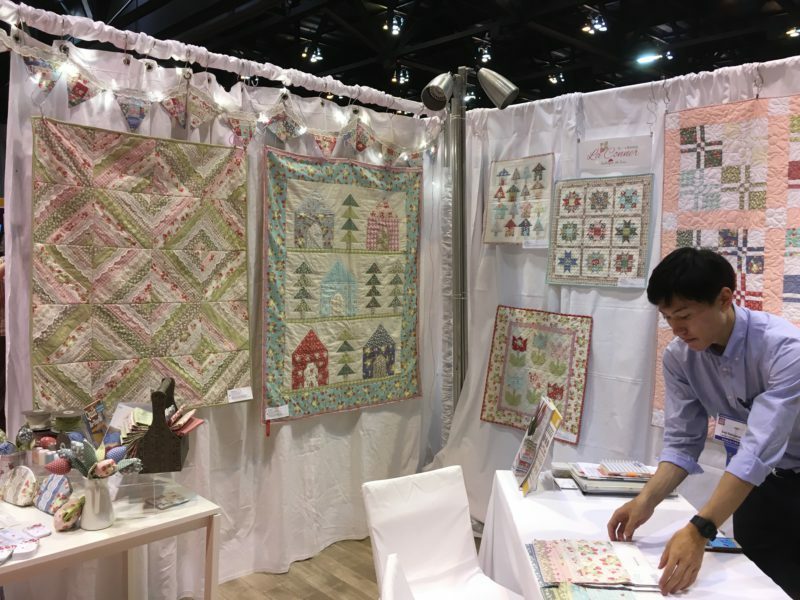 Quilt market is held twice a year, in Spring and Fall. Though I was only at market for 2 nights/3 days, I had a wonderful time! 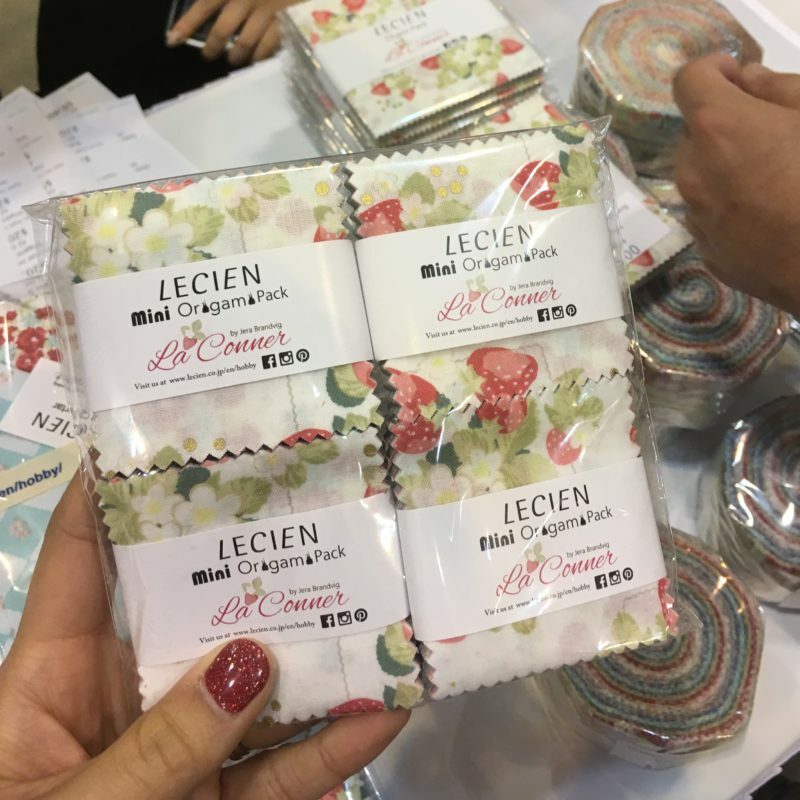 The first evening I helped the Lecien team finish setting up our booth, the next day I was there for a school house presentation and sample spree, and the last day I was there for day 1 of quilt market exhibits, but only until 3 pm as I had to catch a flight home. Like I said – it went by too quick! 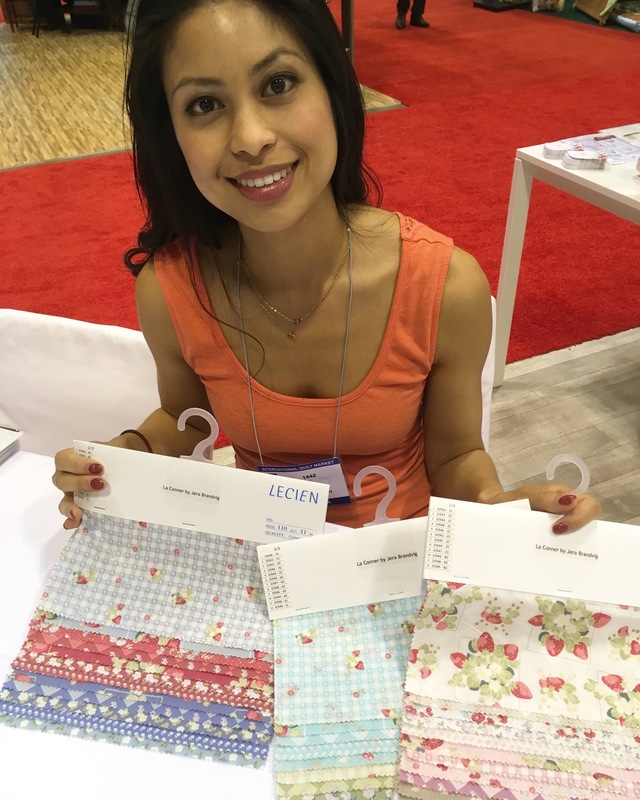 As you may know from my last post, I was at market debuting my second collection for Lecien Fabrics called La Conner. 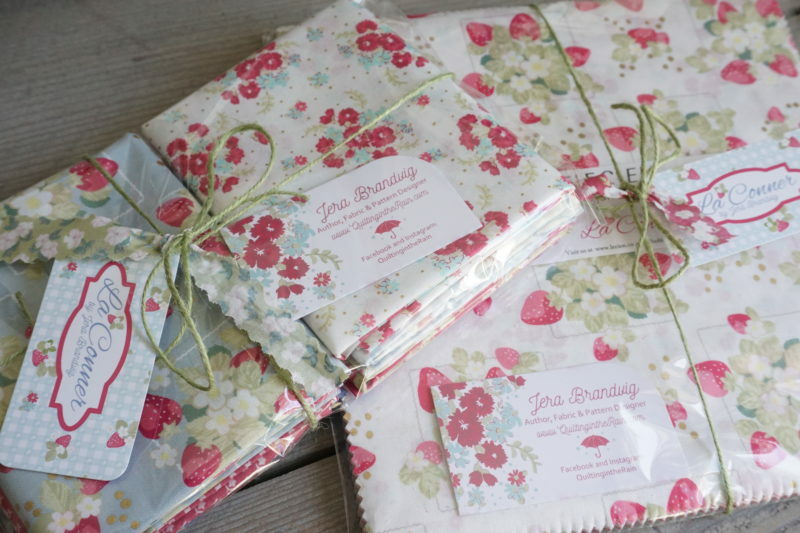 Please visit that post for a closer look at the fabrics, as there’s a bit of sparkle to them! I really had fun designing with metallic gold and silver. 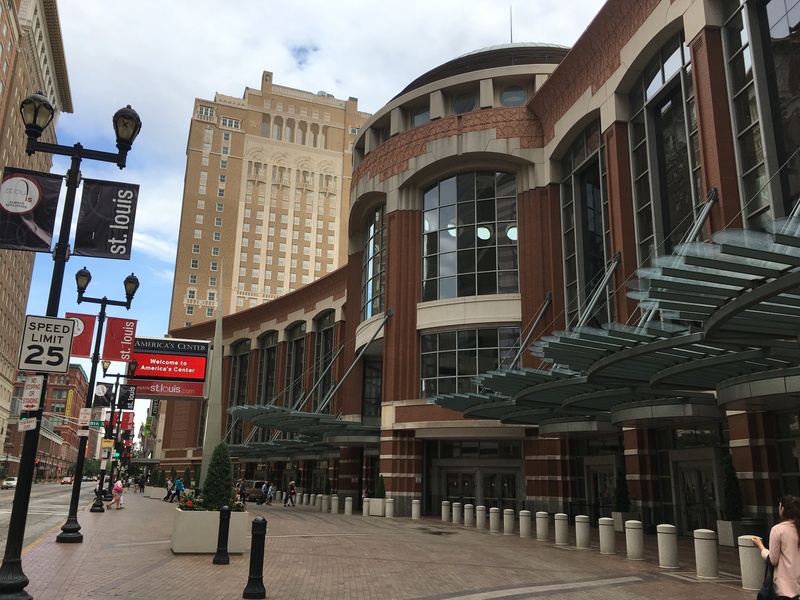 Day 1: I left my home in Seattle at 3 am, and finally arrived at the convention center in St. Louis by 4 pm. It was a long day of traveling! As soon as I arrived, it was booth set up time! 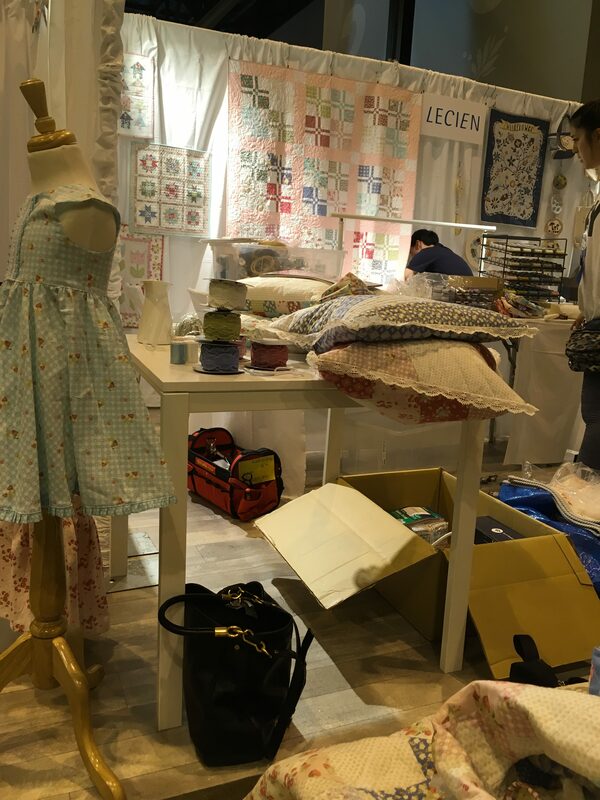 The wonderful Lecien team, most of whom traveled all the way from Japan, had been setting up since the day before. This was the calm before the storm. I tried to capture as many pictures as I could before things got busy. 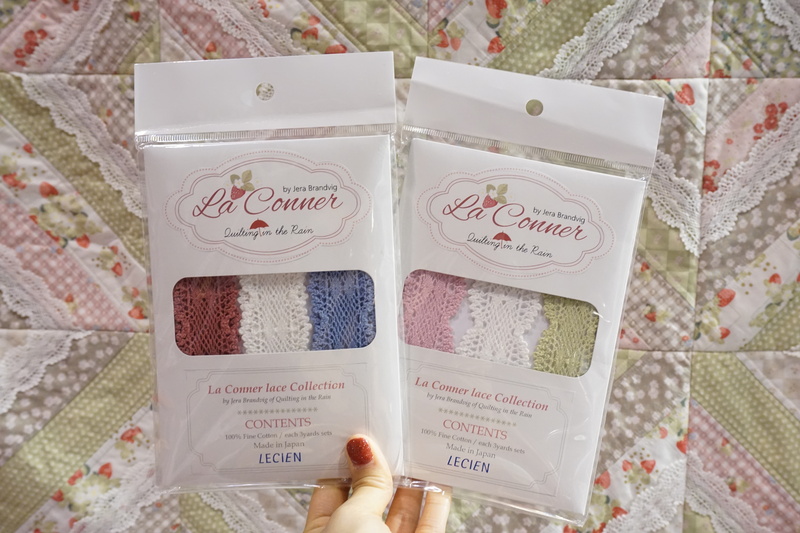 La Conner collection comes with coordinating lace and thread – so many fun notions! 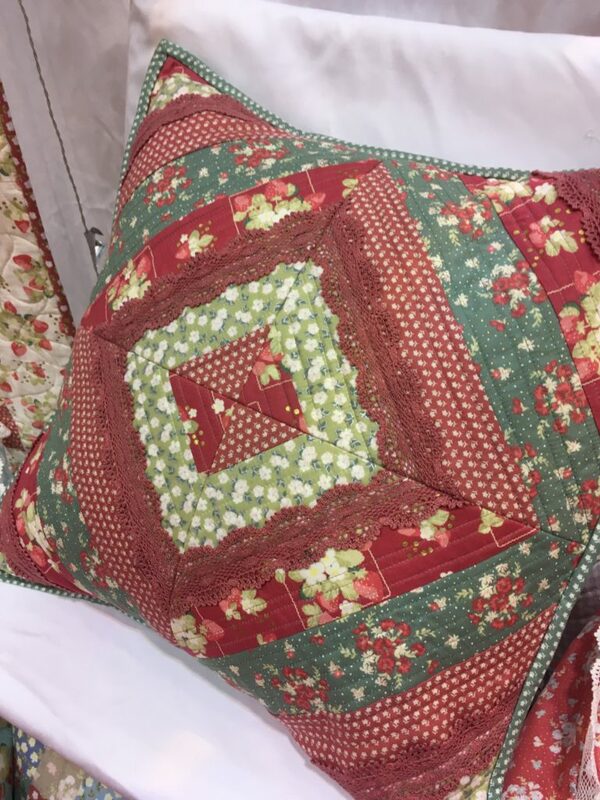 I finished this Christmas-themed pillow literally one day before leaving for market. The evergreen and cranberry colorways combined are perfect for the holidays. I made this via quilt as-you-go. 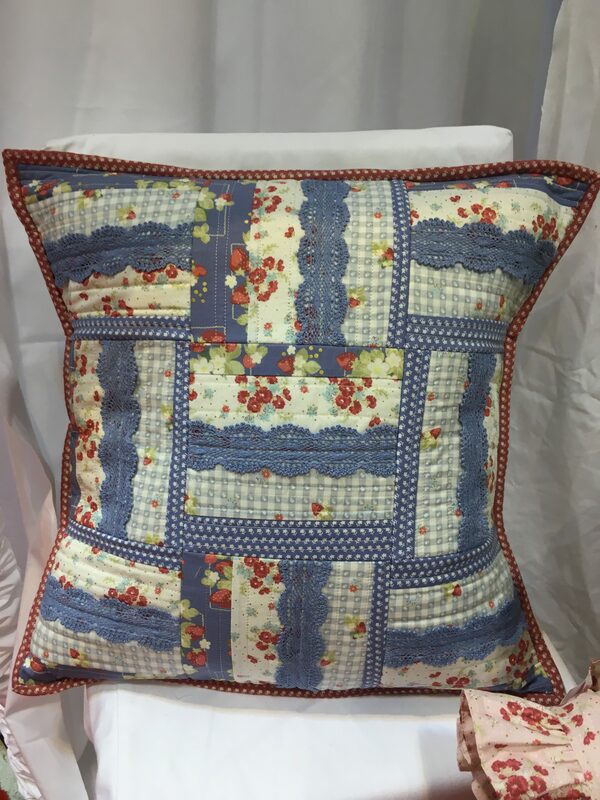 Another pillow I finished last minute. This one has more of a Summer feel to it. 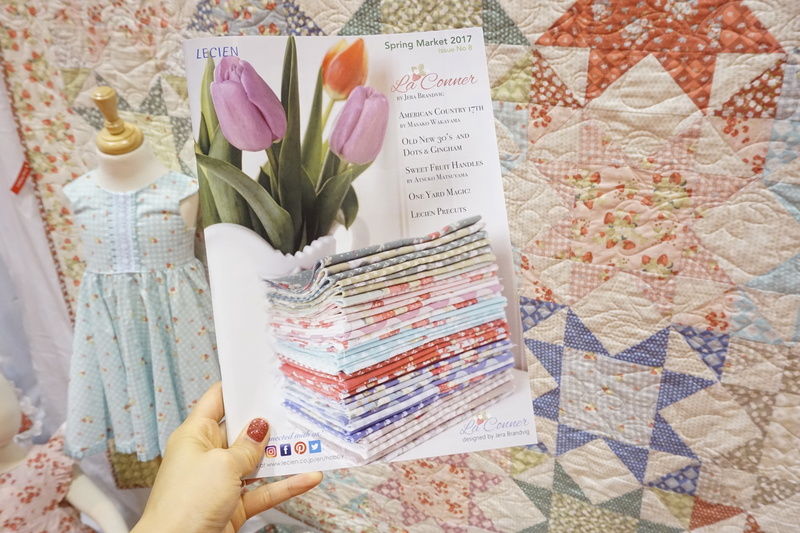 I was very thoughtful when choosing the colors for La Conner collection as I wanted it to be a collection that can work for shops year round. You’ll notice the two pillows above had lace incorporated. I used La Conner lace, made to match my collection. 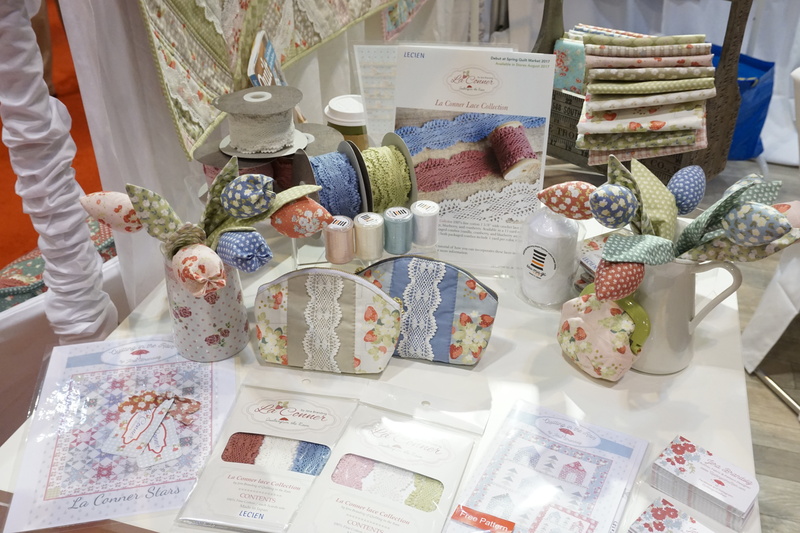 Two beautiful sets, one in the cranberry/blueberry/vanilla color way, and the other in the peony/sage/vanilla color way. Aren’t these dresses darling?! These photos don’t do them justice, so i’ll have to make a dedicated post later. 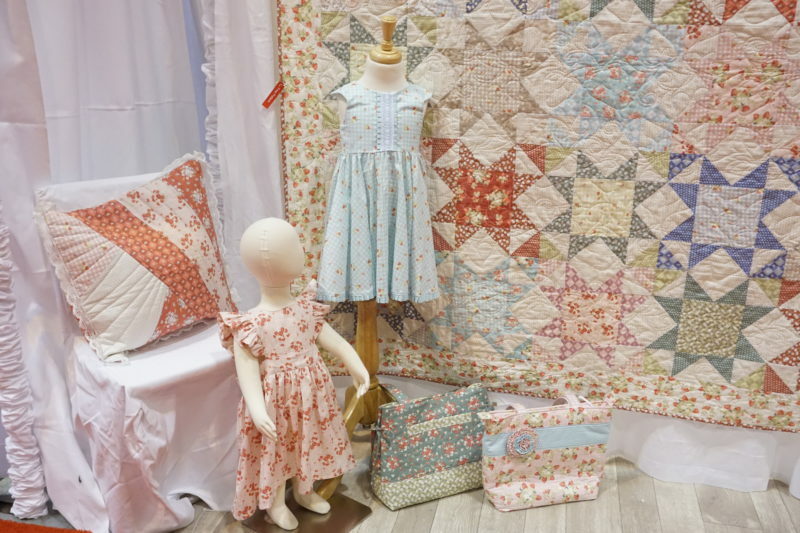 They are made by Natasha of Ellie’s Handmade – she is seriously one talented seamstress! She makes this tired mama of 2 boys (that being me 😉 want to have a baby girl, for the sole purpose of wearing one of these darling dresses! :-p haha! Our pillow game was strong at market. 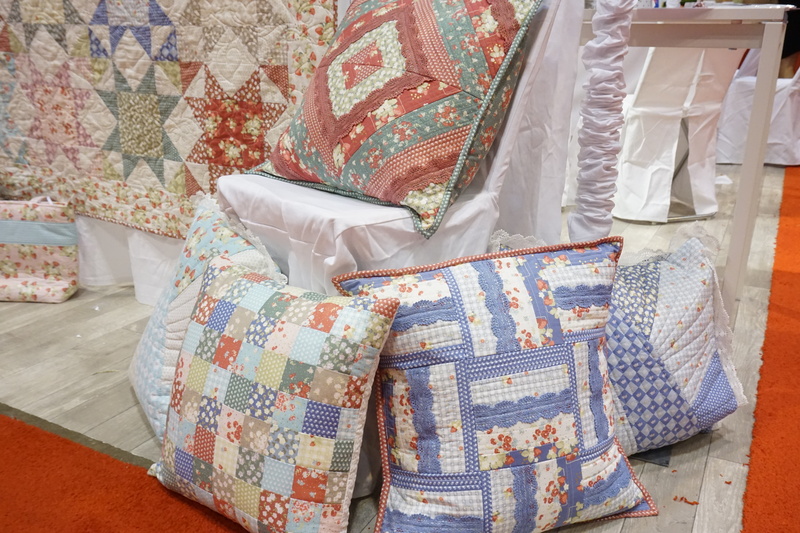 The patchwork pillow on the bottom left was made by Allison Jensen of Woodberry Way. 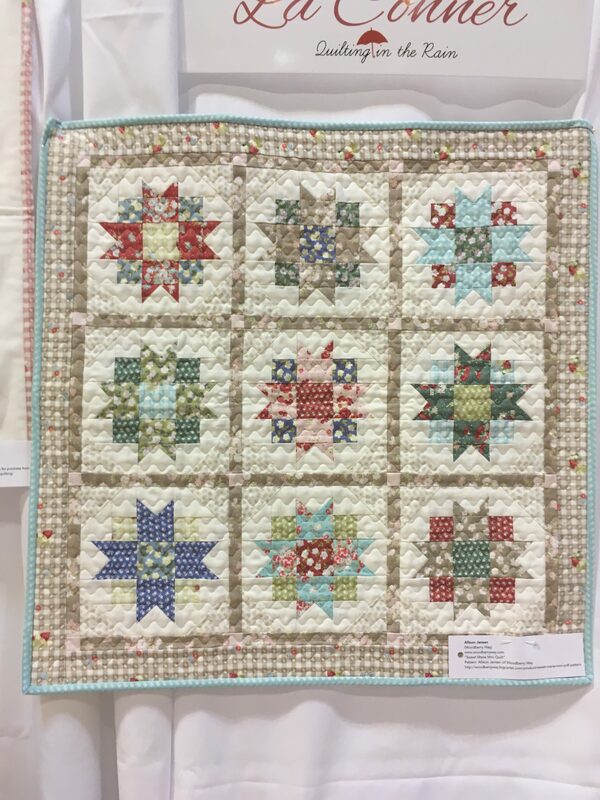 My only regret is that I didn’t capture a photo of the other side of her pillow, which was a beautiful aqua star with hand stitching all around it. I admit to being OCD and rotating the pillow throughout the day during market, as I couldn’t decide which side I liked best. This really isn’t a great photo, but inside the catalog you can read about my inspiration for the collection. 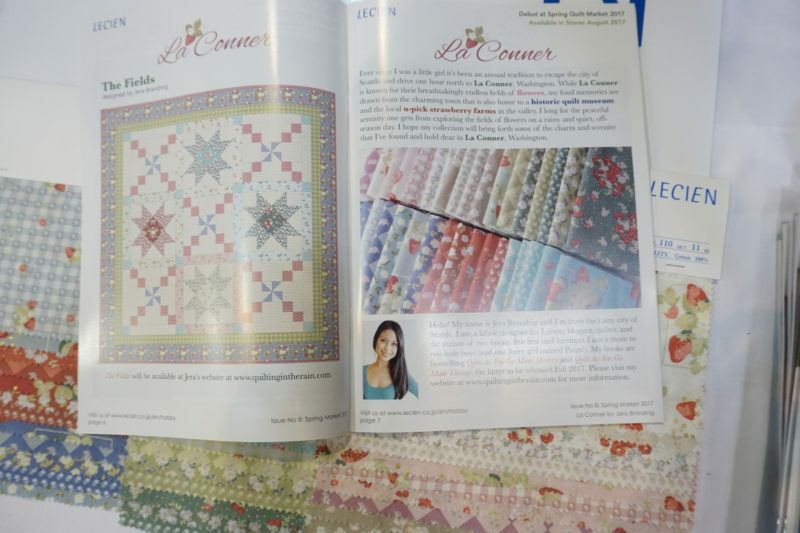 By the way, the quilt below is called La Conner Stars. I will be providing a free pattern for it in a few weeks! I’m just waiting to get the quilt back from market so I can photograph it in better lighting for you all. I am so thankful to have gotten so much help from talented friends I’ve met through Instagram. It truly takes a village to gather enough projects to fill a booth. With my first collection, I didn’t reach out for help as much as I should have and learned the hard way. This year I made an effort to step outside of my comfort zone and ask for help, and well, just see for yourself…! 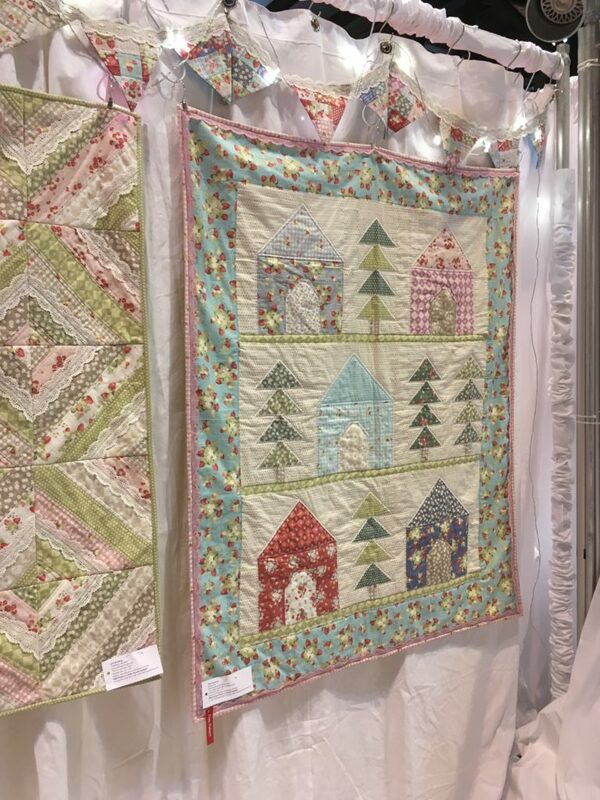 The Cozy Cabins quilt below was made by my friend Faith Essenburg of Sarana Ave. 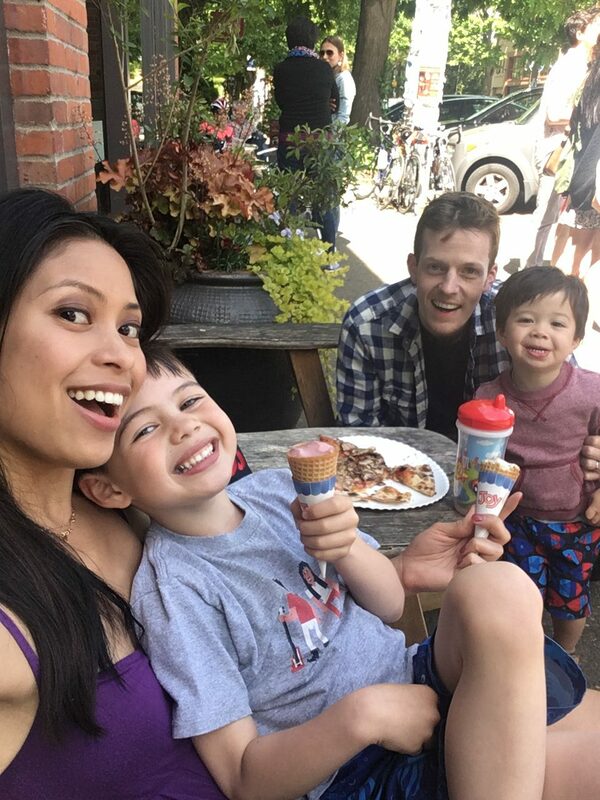 Faith is a rock star mom of three beautiful kids and does such beautiful work. 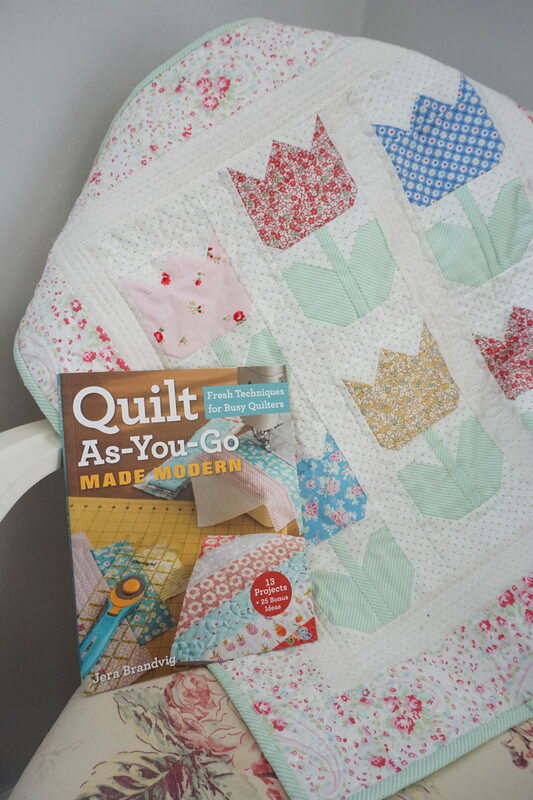 Faith also made a quilt for my 2nd book which will be released this Fall. This Cozy Cabins quilt is a pattern I made that will be available for free very shortly (yippee! ), so please stay tuned. I also included a free mini version of this quilt in the pattern. This next project was made by the lovely Renee of Sewn With Grace. 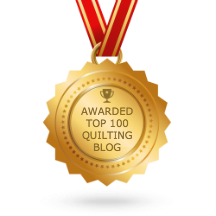 Be sure to check out her blog to see all the beautiful quilts she makes. 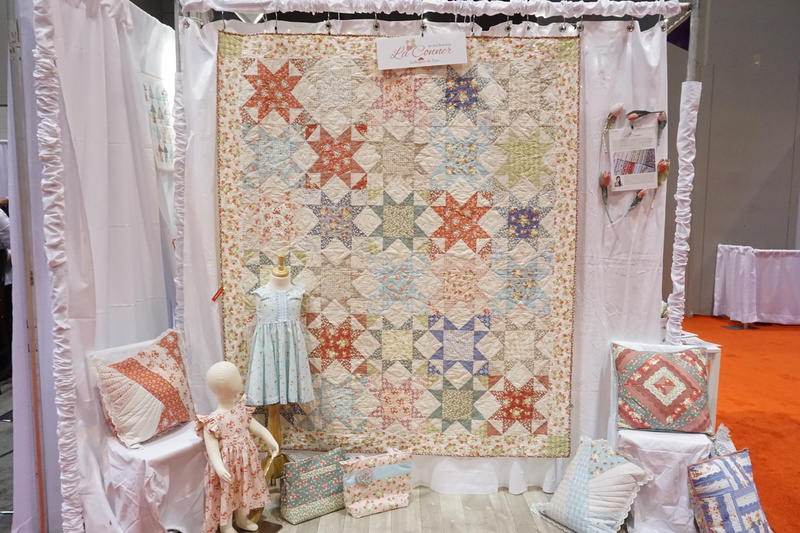 I couldn’t resist and am going a bit off track here, but you just have to see the quilt she made using my first collection – you can sneak a peek here. 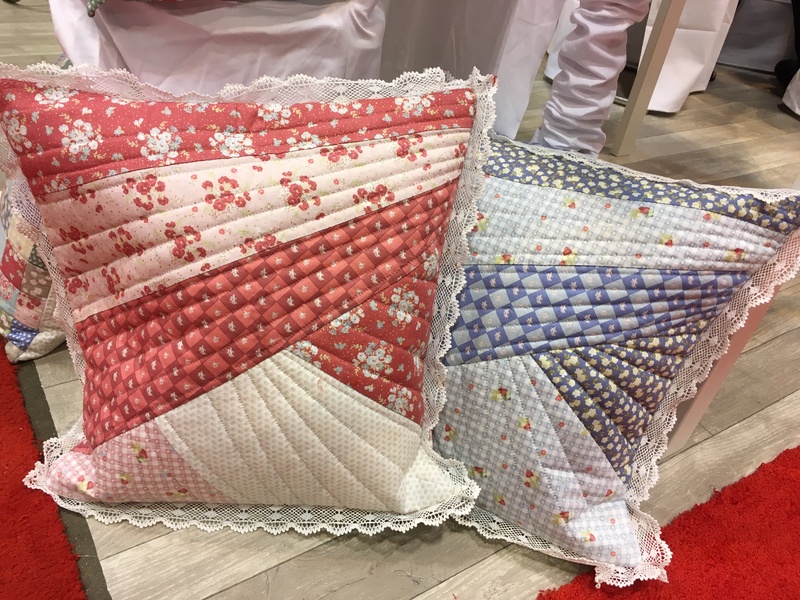 These cute, whimsical pillows were made by Lecien. 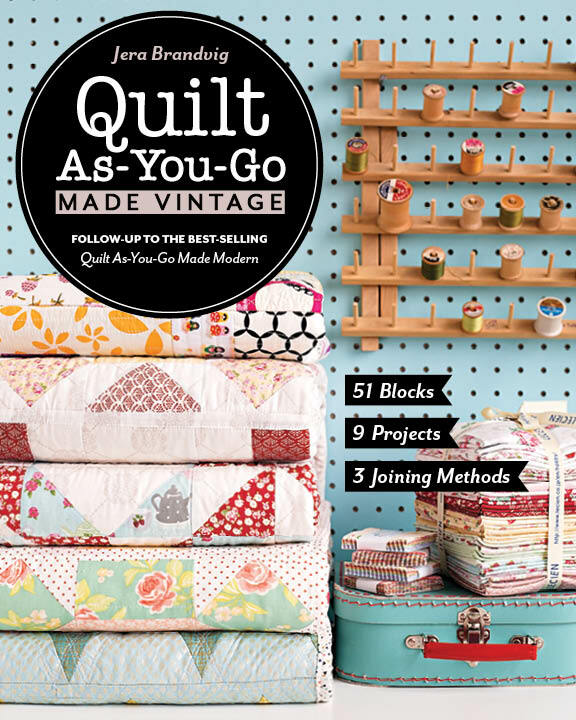 About mid-way through market I realized the pattern was from my first book, Quilt As-You-Go Made Modern! I love the added La Conner lace. 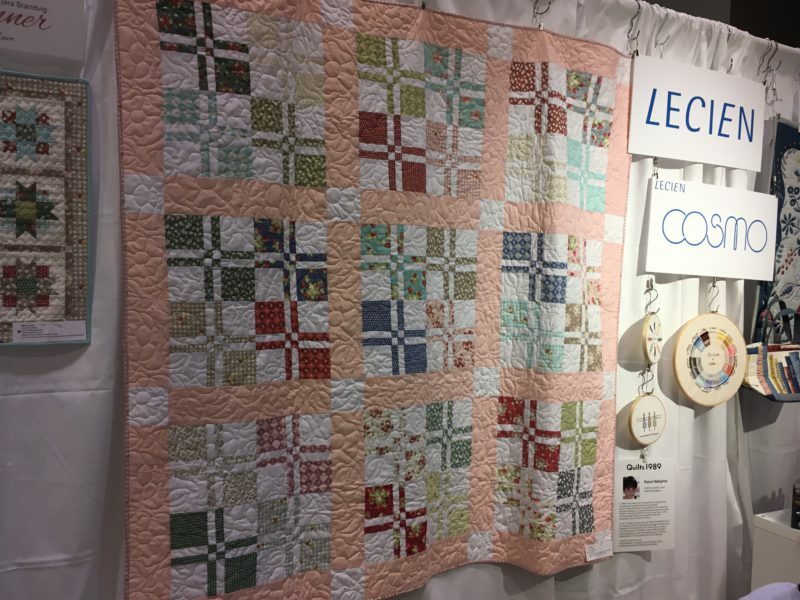 This cute mini quilt, which showcases all 36 La Conner prints, was made by Ange of A Little Patchwork, all the way from Australia! 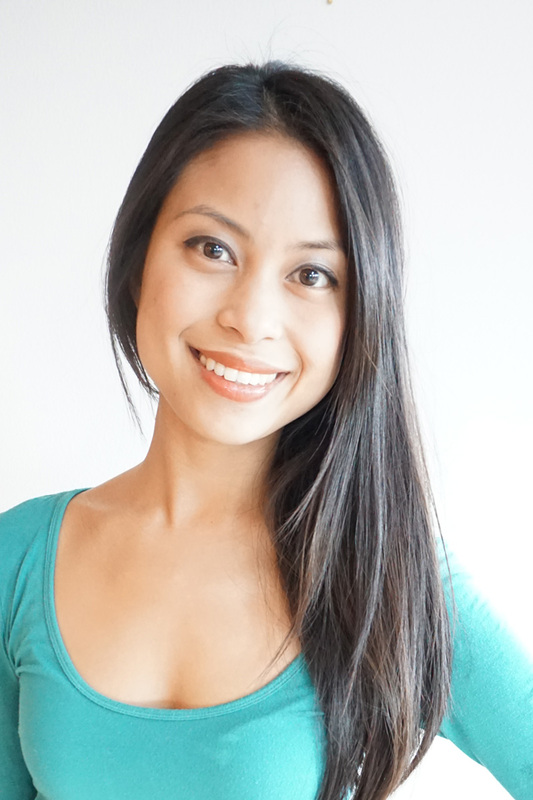 Ange has such a sweet and warm personality, she is such a pleasure to work with. 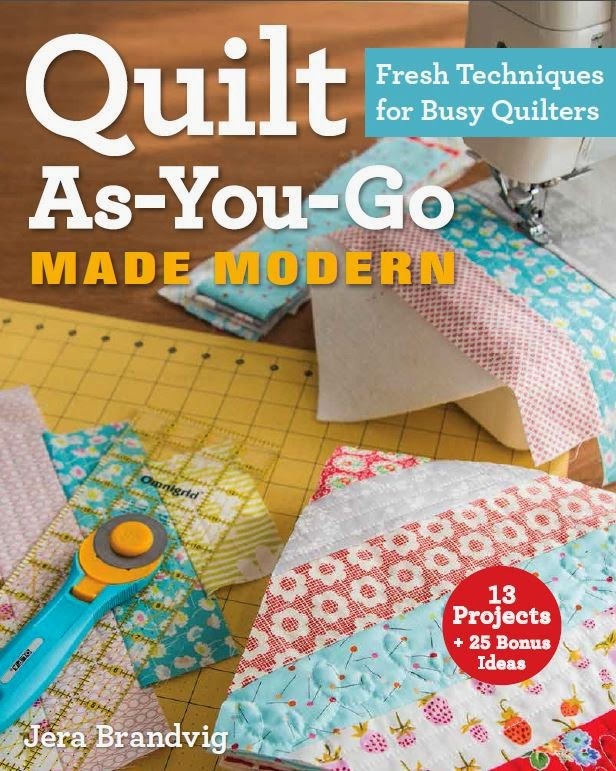 The pattern is from Jemima Flendt’s new book, Weekend Quilting. 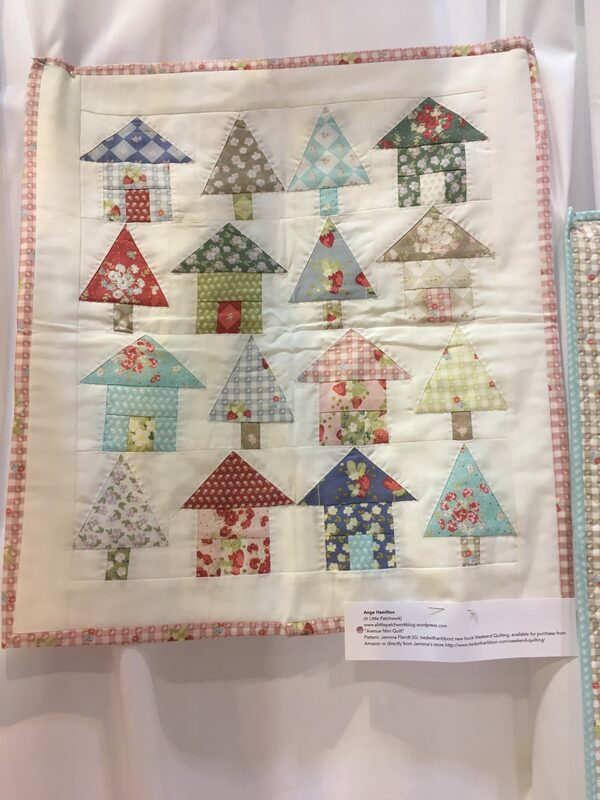 In addition to the cute pillow sham aforementioned, Allison of Woodberry Way also made this perfectly adorable mini quilt. 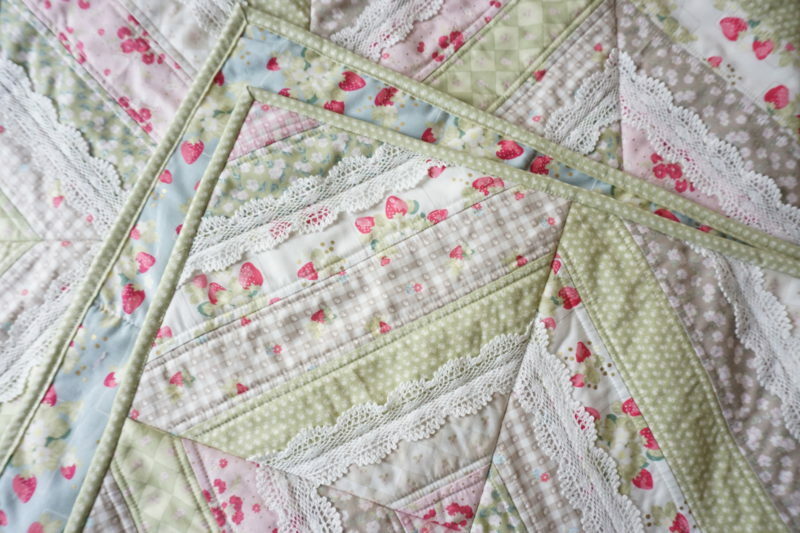 This is the Sweet Marie Mini quilt pattern which you can purchase here. 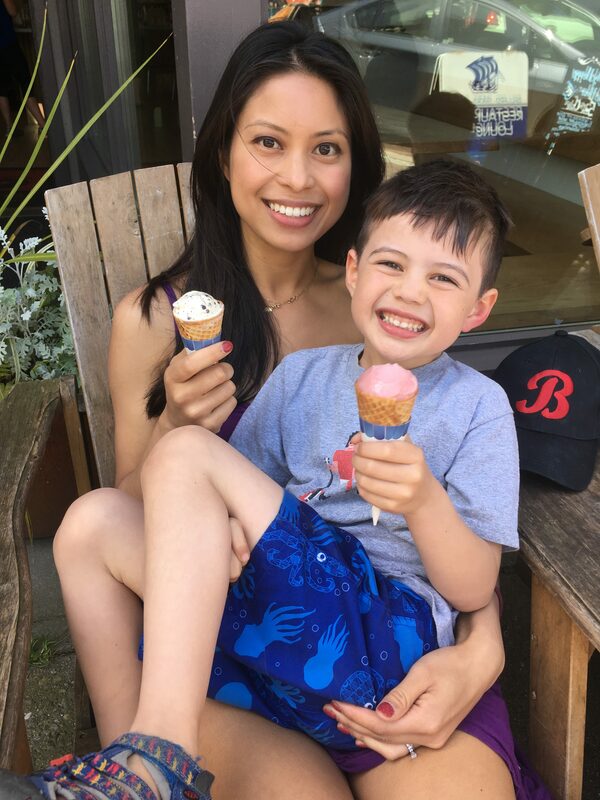 In addition to being a mama-boss of 3 boys, Alli is the boss at making beautiful and well-written patterns, so be sure to look at her pattern shop. I aspire to make patterns as beautiful as hers! 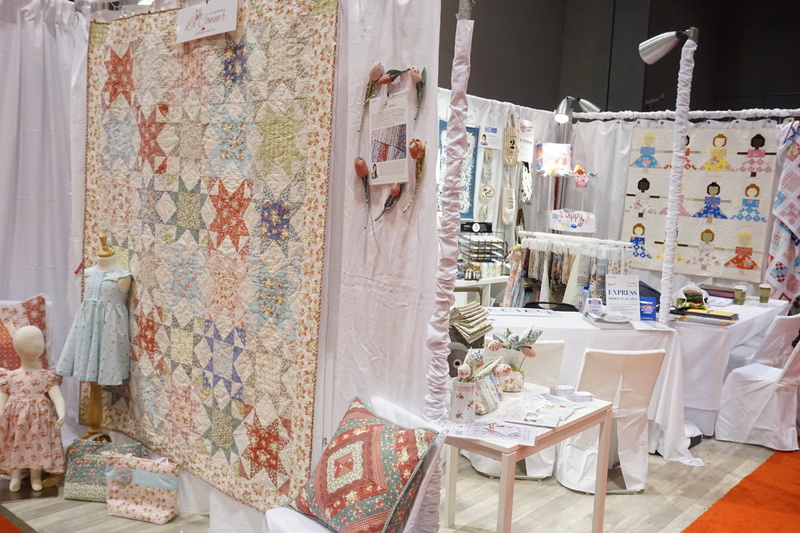 I seriously can’t thank these ladies enough for all of their help in making our booth beautiful with their quilts. Below is my little quilt as-you-go corner. On the left is my 2nd book, to be released this Fall. 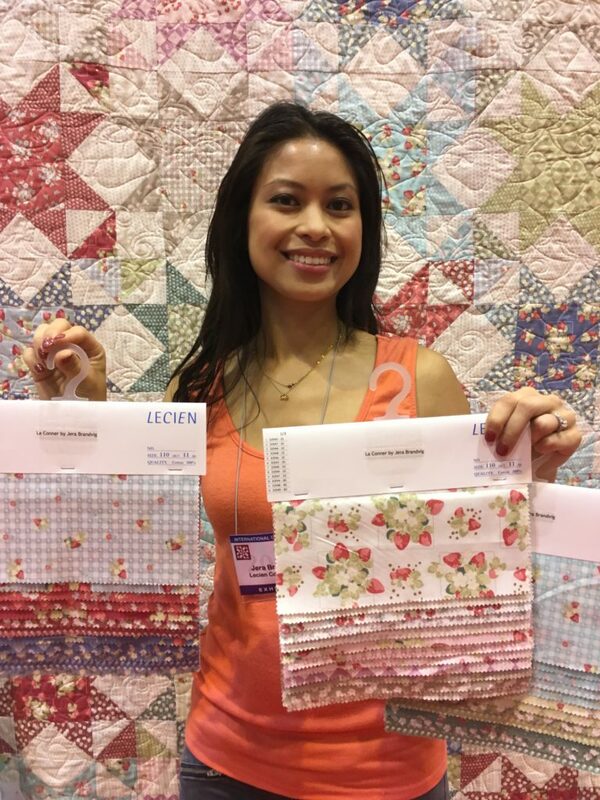 The lace strip quilt on the right was made via QAYG techniques. Here’s a better photo of it. 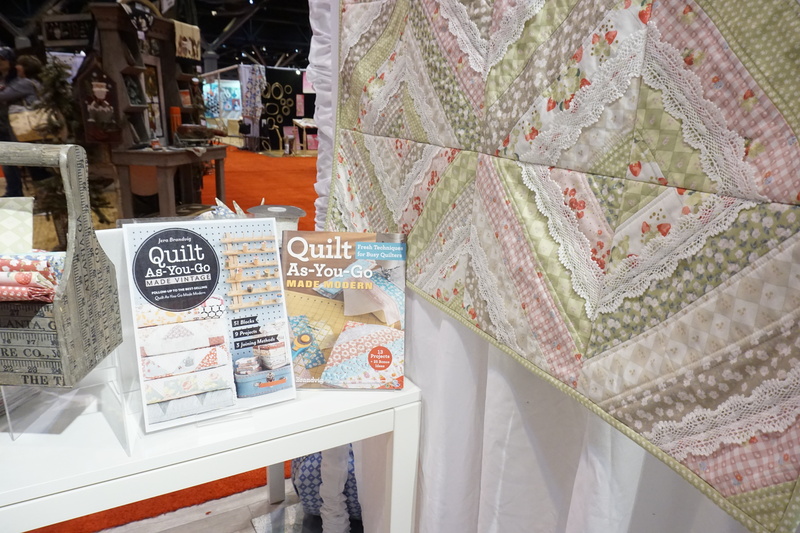 It’s so much fun incorporating lace in quilting! A video tutorial is coming soon for this one as well…can’t wait to share more, as I’ve been a busy bee preparing so much for you all! And last but definitely not least, is team Lecien! 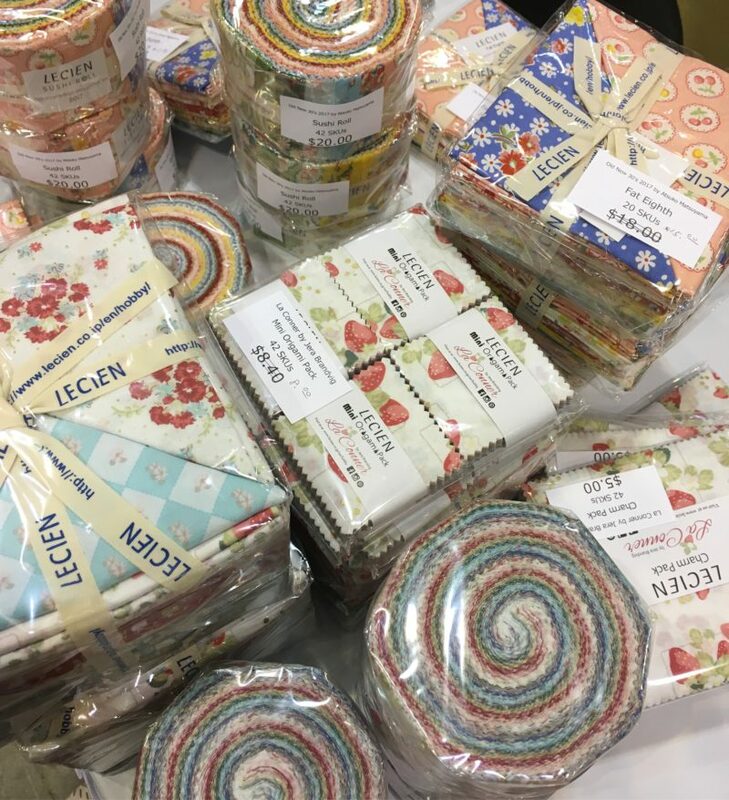 This photo doesn’t include all the amazing in-house designers from Japan that have created the well known Lecien collections such as Flower Sugar, Rococo and Sweet…the original collections that made fall in love with Lecien to begin with. 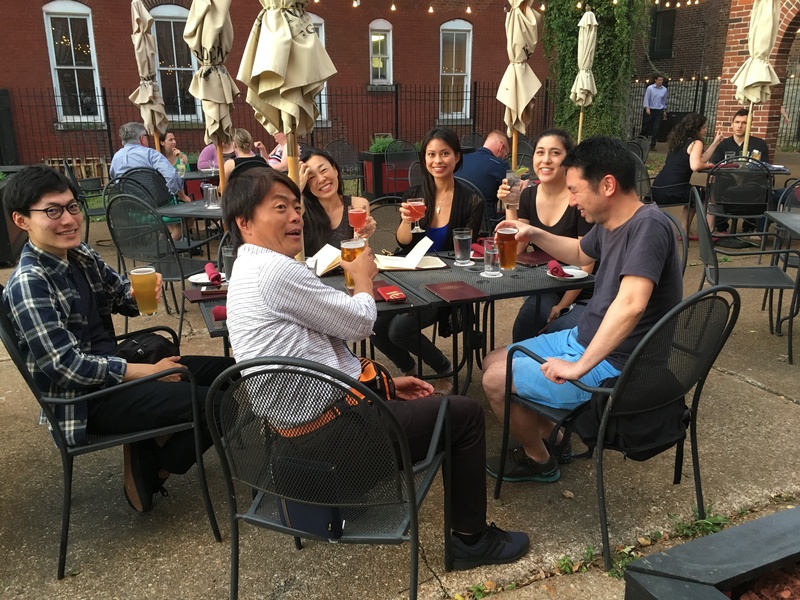 Jet-lagged from the Japan time difference, and tired from traveling and booth setup, here we are cheers-ing to quilt market! Truly a good bunch of people, and I am proud to work alongside our tight knit group. It was a lovely and warm evening in St. Louis! Okay…so that was a recap of Day 1. On Day 2 I had the opportunity to do a school house presentation to all of these lovely people. Here I am trying not to forget to say anything important, as our time was limited and rushed. That evening was sample spree…! 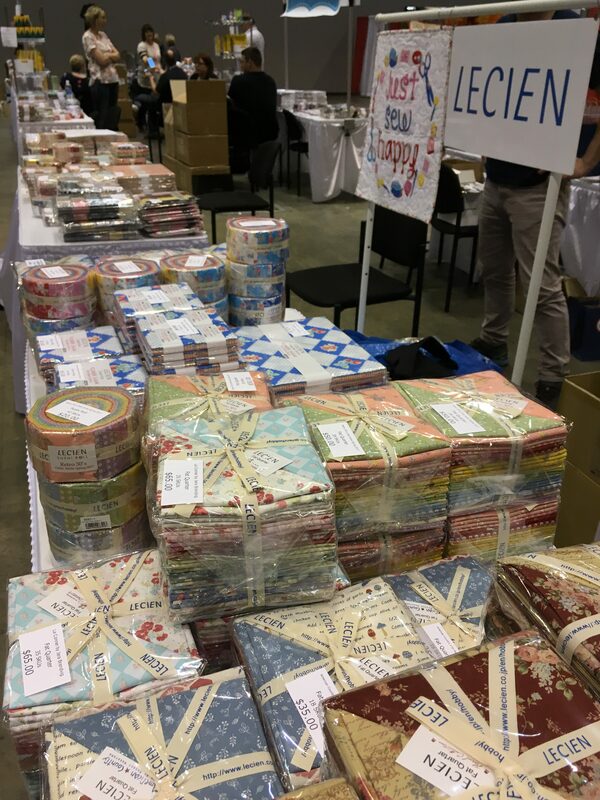 Sample spree is basically a mad rush for people to buy fabrics early for their shops, as all of these fabrics are not available until 2 or 3 months out. And here I am holding my (fabric) babies for the first time. I am happy to say that La Conner sold out at sample spree! Sample spree ended at 9:30 pm, followed by a late dinner with team Lecien. Day 3 of my trip to market was the official opening day of Quilt Market’s exhibits, in other words, all the booths were now open…including Lecien’s! I had to leave by 3pm to catch my flight home, so the short time I was there it went by like a whirlwind as you can imagine! It was a wonderful whirlwind, though! 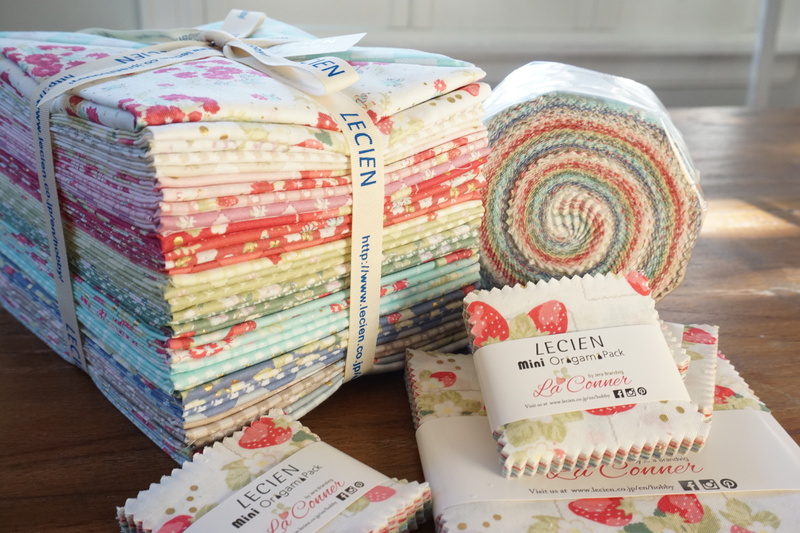 A sincere thank you from me and the Lecien team to all that stopped by to say hello! 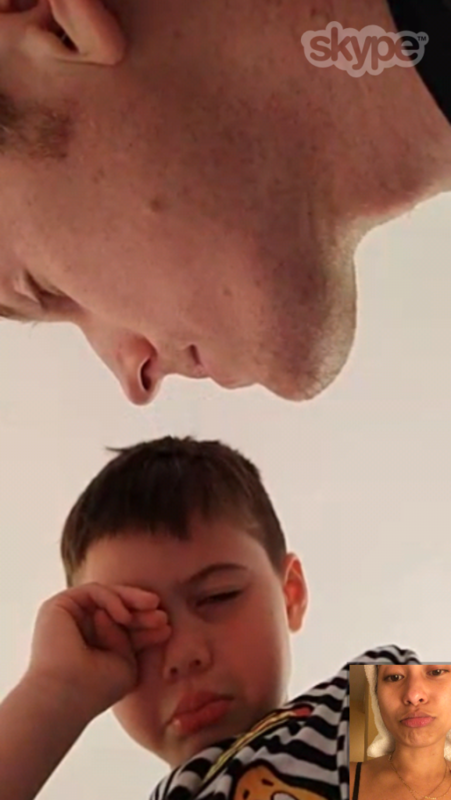 And sorry for anyone that I missed! On a different note, I wanted to quickly share that I donated the following gifts to the town of La Conner. This is the town of La Conner that inspired my whole collection! These donations go towards an auction to help keep their flower baskets alongside their sidewalks looking beautiful. 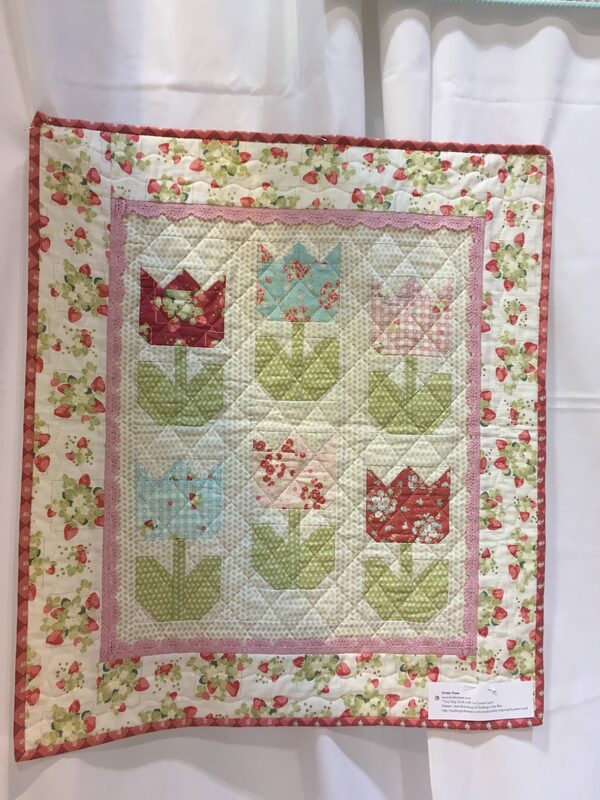 I also donated a signed copy of my first book, and my Tiny Tulips mini quilt. 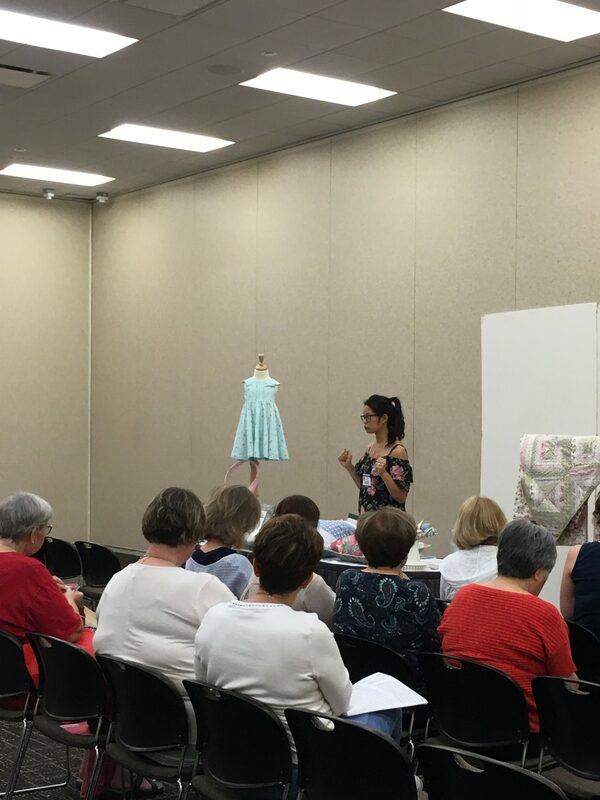 Thank you so much for stopping by so I could share La Conner with you, as well as my fast and furious quilt market experience. 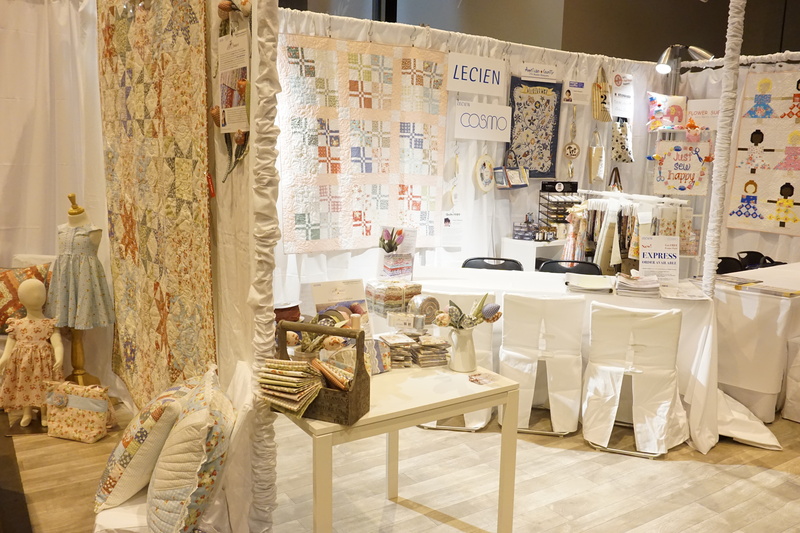 I had a great time at market and I am so thankful for the wonderful Lecien team I work with, all the talented makers that played a huge role in making our booth beautiful, and for this opportunity to meet some of you in person and share La Conner Collection with you all. 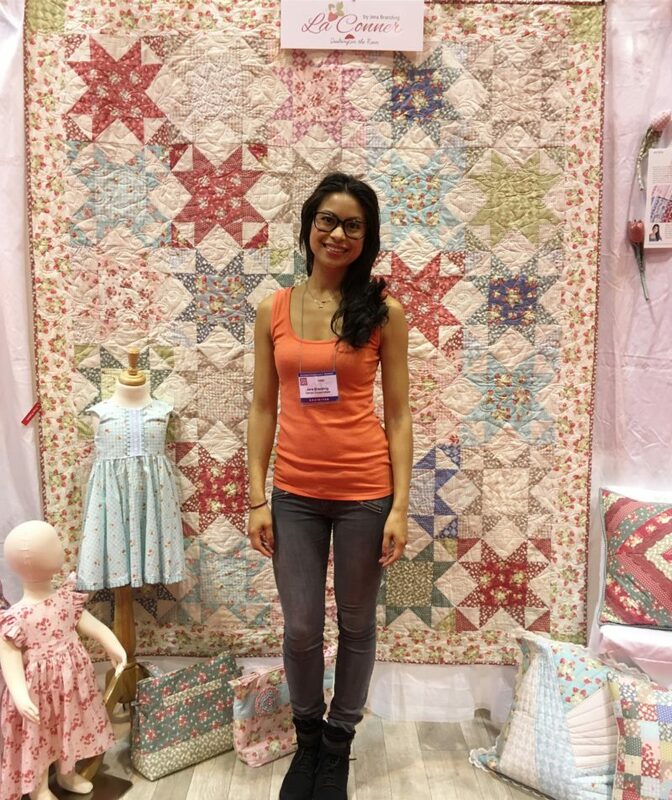 You did a wonderful and beautiful post of Quilt Market! 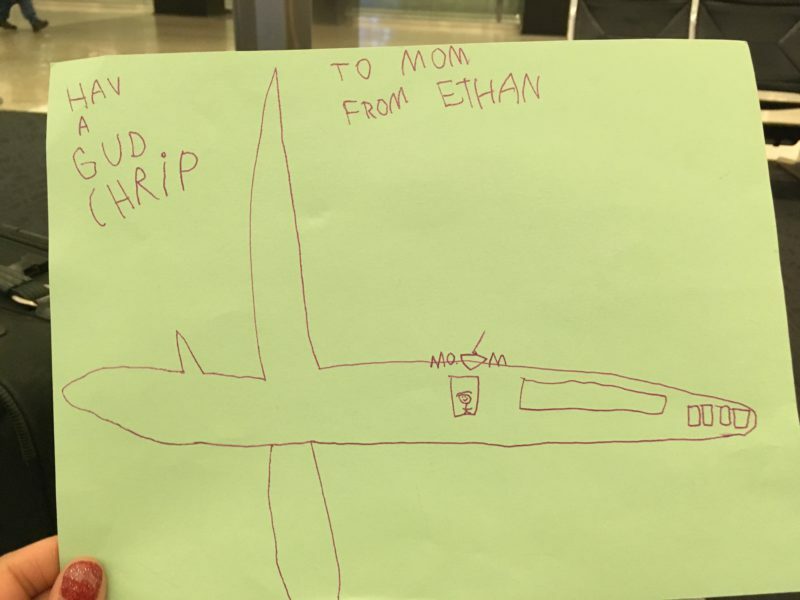 I can just imagine the joy – when you got back home to your family – for you and for them! 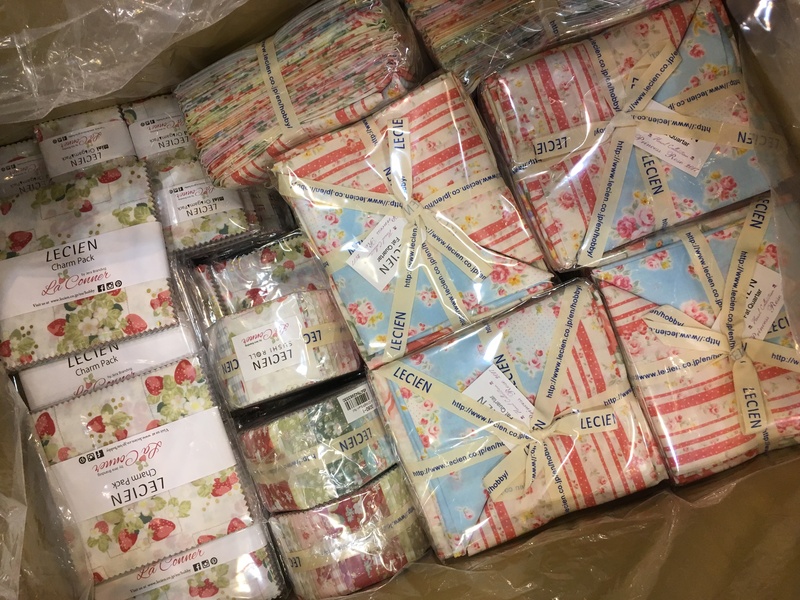 So glad that your fabric sold out at Sample Spree! Beautiful fabric line! This was fun to read. Thanks for all the photos and inspiration! Hope your weekend is grand!! 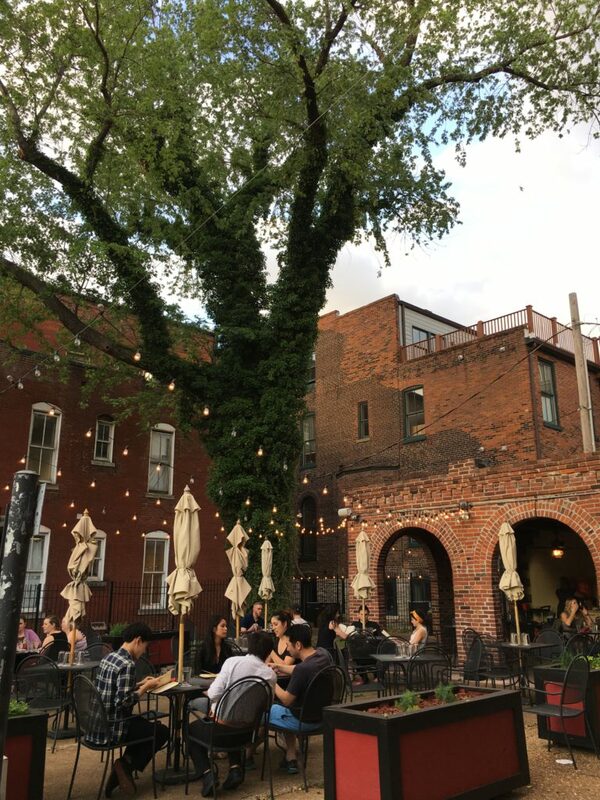 Enjoyed reading and seeing all your pictures from market. 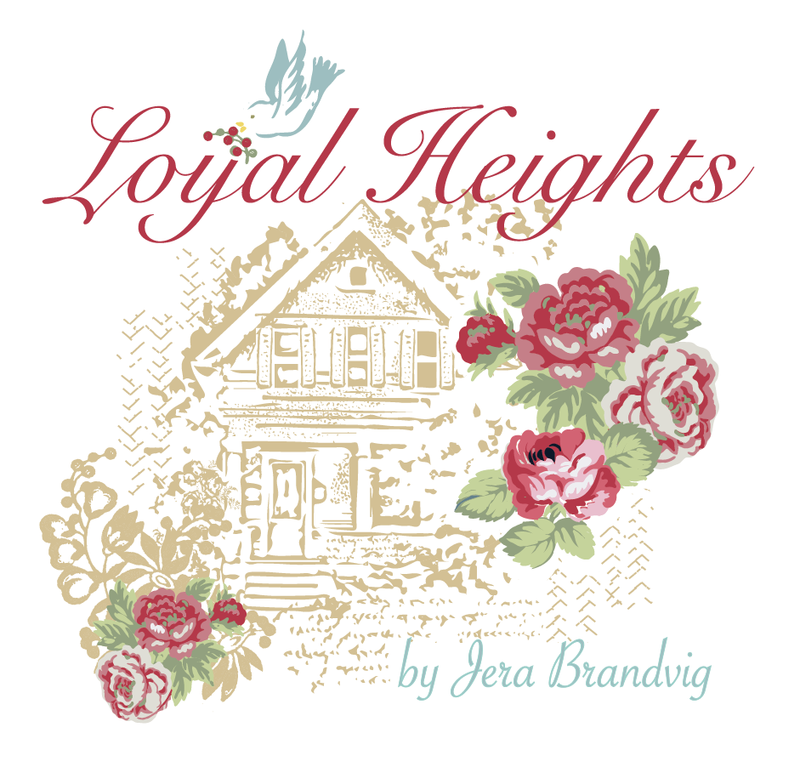 Your fabric line is beautiful and I need to order your new book. I have used the first one and love it! 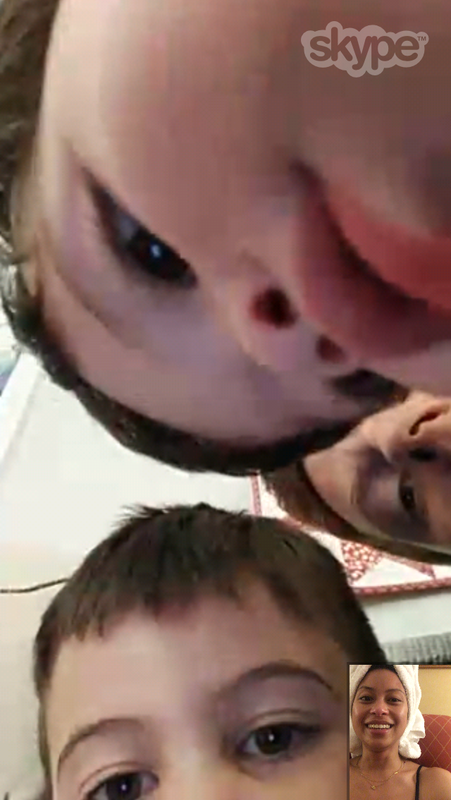 very nice new products, and your kids are cute. Will in be in the FatquarterShop.com? Thanks so much for sharing your whirlwind adventure – I stumbled across your book at the library and have been so happy to find your blog. Thanks for the amazing inspiration!